Teenagers attacked a lifeguard on opening day of the McCarren swimming pool. The lifeguard had reprimanded the teens for reckless diving behavior. There was a bit of buzz about the event, but generally it seemed to be ignored. There was a suggestion that lifeguards should be adults, as if teenagers respect adults. Teenagers push limits, it’s actually their job. But there is more than a thin line that separates normal developmental boundary pushing and attacking another person. The real issue in an attack on a public lifeguard (besides the guard’s safety) is the alarm bells it should be ringing. If the only person(s) of authority at a public facility are shown no respect what are the other swimmers shown? What kind of environment are these potential emotional terrorists creating for hundreds of other people. The moment after this incident occurred was the time to initiate the ‘zero tolerance’ policy. A pool is not a right nor is it the public education system. One strike and you’re out. The tone must be set from the very beginning that there are rules of civility in public spaces. Clearly this tone hasn’t been set as three days after the lifeguard incident swimmers punched a police officer in the face. The officer was assisting the lifeguard reprimanding the teenagers for diving. A second officer was injured as well. Now before I get all “what in tarnation is going on here” let’s remember that this is a very large pool! About 1,500 people can fit into that pool at one time. It stands to reason that a majority of those people are under 21. That’s a lot of kids. That’s the size of most high schools. Add to that the fact that the pool has been closed for 28 years and you might have one or two generations who have never been to a public pool. This is why you have clearly stated rules and zero tolerance policies. However, even if you have never been to a public pool you know you’re in public. What in fact does it say about us that regardless of pool experience our teenagers would even consider attacking anyone let alone a lifeguard or police officer? None of the perpetrators were identified as a roving gang of thugs (it’s hard to imagine swimming gangs isn’t it?) By all accounts these were just regular old teens looking to feel more important than they actually are. But when exactly did that age-old bravado cross the line into borderline sociopathic behavior? When did they get the idea that it is actually acceptable if not even cool to attack people?! But for every good student who did show up on time and did complete their homework who has to sit and listen to the teacher’s tirade, I say focus on the kids playing by the rules. 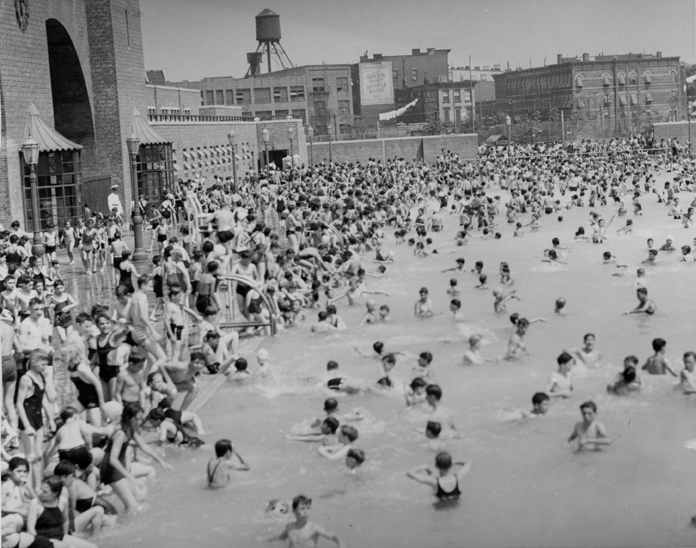 McCarren (and every other public pool) should be a safe and enjoyable respite for all. Let’s be clear, anyone who attacks a person of authority has no problem wreaking havoc on civilians. It is intolerable that 1,400+ people should feel intimidated. There is a very small window in setting a tone for a short season. A little crackdown in the next couple of (steaming hot) days will go a very long way.